Back to Paris, this time in my imagination. It’s been hard for me to leave behind all the writing inspiration I find there. And my daily indulgences like pain au chocolat and an afternoon café au lait that fed my writer’s spirit. Here’s another Paris moment, brought alive back home in front of my computer by a series of photos on my phone. While my notebooks and pens were always in my bag, ready to be scribbled in, I was too immersed at this particular moment in what I was hearing and seeing to take notes. Quick photos would have to do. 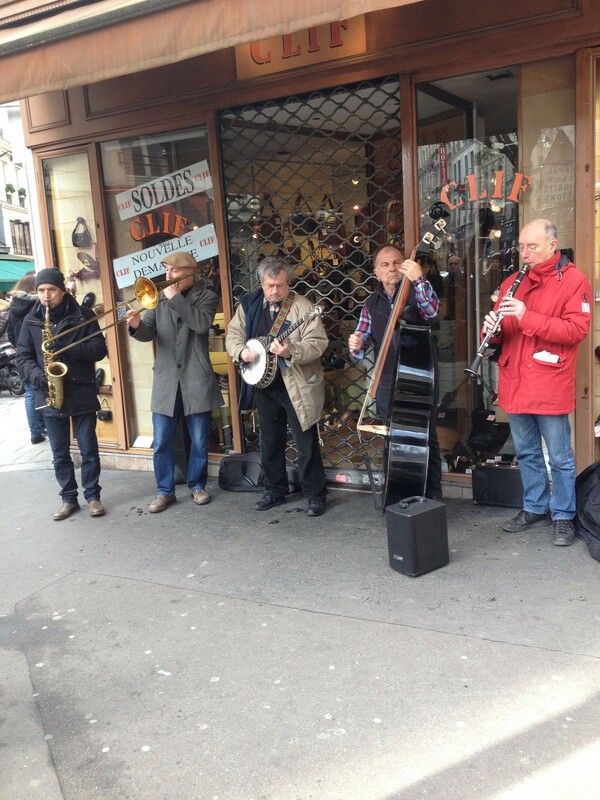 We stepped out of our courtyard onto the Rue Dauphine into the round full sounds of a jazz saxophone. It floated down our street from the next corner and the glorious notes slipped around my ears. I was so happy to be here, to be walking single file down this narrow street with tiny sidewalks towards the music. By the time we reached the corner the deep bass had jumped in, as well as the plunk-plunk of the banjo, the birdcall of the clarinet and the low, velvet sounds of the trombone. A small crowd was gathered around five musicians of a certain age and no one was talking. Everyone was smiling. All eyes were on the five men caught up in the joy of their mellow music. They were clearly seasoned professionals, the music was that good. I stared. The melody, the riffs, the sunshine filled me up. I grinned like a happy child. I felt an increased admiration for Woody Allen, a kinship. A pride to be an American too. Spectators were tapping their feet, clicking their fingers. Some were nodding, Aaaah, Wood-y All-en. Accent on the last syllable. Sensationelle. Woody Allen, it seems, loves Paris. He sees Hemingway there, and Fitzgerald. Corny? Not for me. So do I. So Writers, Pull out your phone, capture something great, and WRITE ABOUT IT. 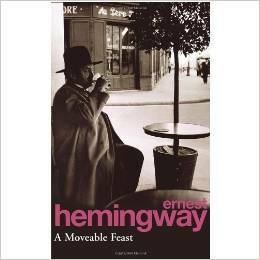 A Favorite Book: A Moveable Feast by Ernest Hemingway. I liked it even better the second time. He doesn’t always write in short, clipped sentences.